Mirror mounted on bracket, easily positioned for a perfect view on rider. 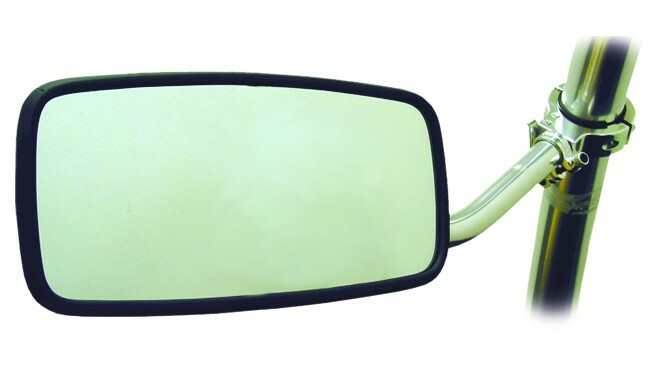 Equipped with quick-release system : mirror can be removed for storage and arm remains on boat. Tower mounting position combined with large size mirror (18 x 36 cm) make it easier for pilot to watch rider/skier. * Mirror supplied with ring int. Ø 64 mm (2" 1/2) designed for Monster Tower. If mounted on a tower of a different brand and different Ø, you must order a kit of collar inserts ref. 64200. Removable, mounted on adjustable arm, easily positioned for perfect view on rider or skier. Tower mounting position combined with large size mirror (18 x 36 cm) make it easier to watch rider/skier. Designed for Monster Tower tubing Ø 64 mm (2" 1/2). Adapts to any other tube Ø with the addition of collar insert.